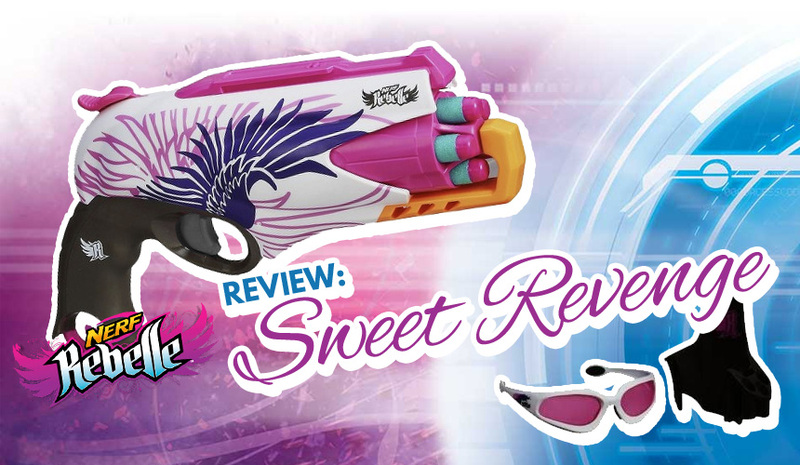 One of the biggest developments of 2013 was Nerf releasing hammer-action blasters, the Hammershot and Sweet Revenge. Prior to these, there were very few one-handable pistol sized blasters, and those usually had several flaws. 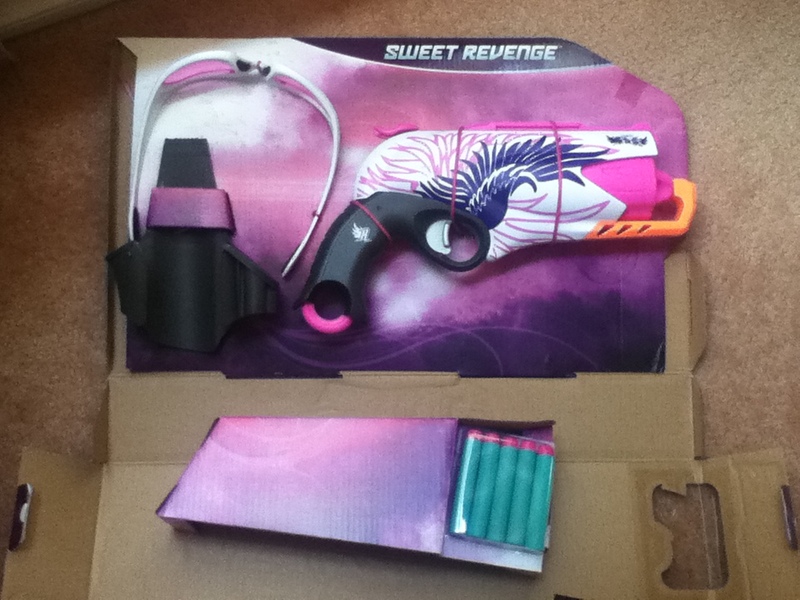 I immediately liked what I saw with the Sweet Revenge, and bought it as soon as it became available here in Australia. Right side of the SR.
Left side of the SR. The SR rotates this dart into top position to be fired. In contrast with the Elite line, and like its Rebelle brethren, the Sweet Revenge has a smooth and sleek shell, with a curved and smooth hooked handle. 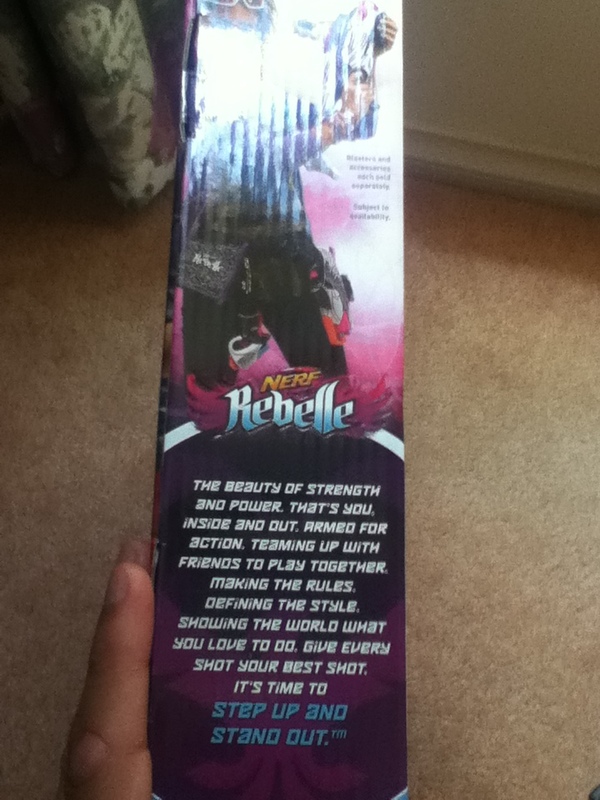 While there was a significant amount of backlash regarding the colouring of the Rebelle blasters upon reveal, the colouring is (in my opinion) done quite tastefully, and is not overly pink. I particularly like the intricate side designs. 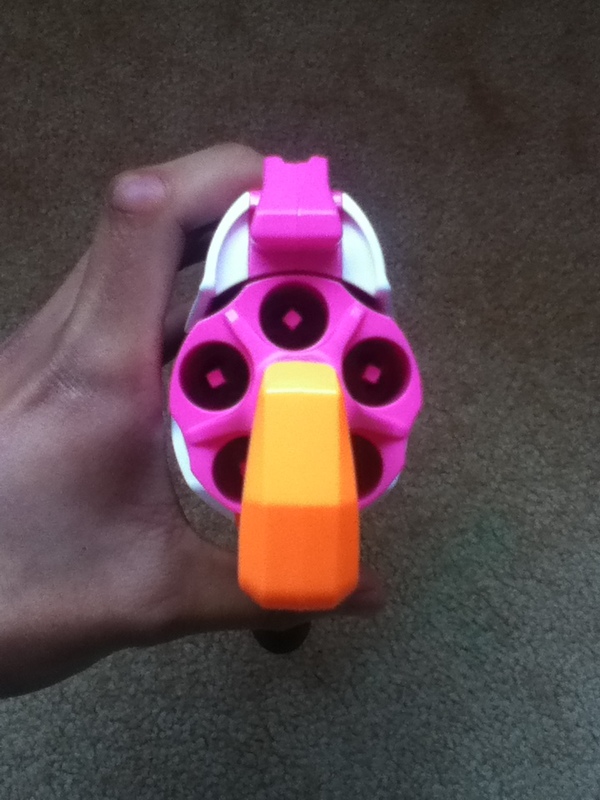 The Sweet Revenge is a 5 dart revolver, and is about as slim as can be. 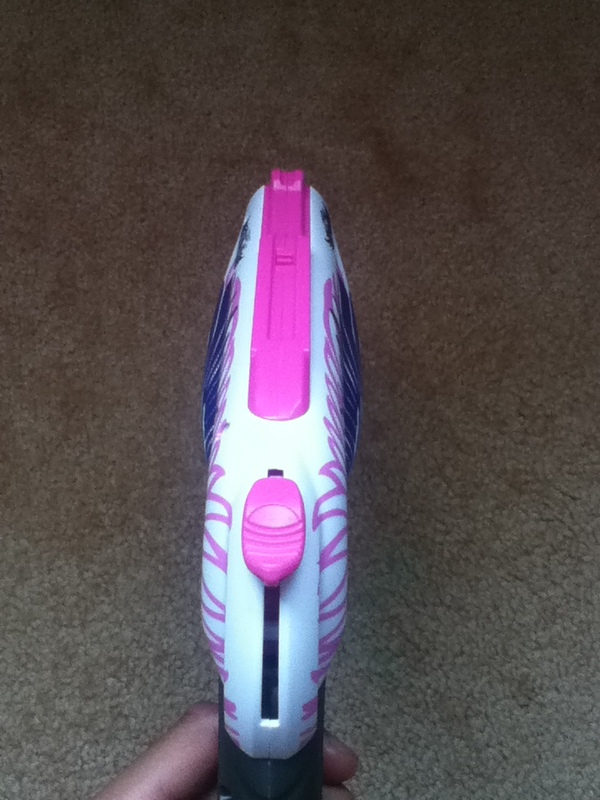 The design lets you load 3 darts at once, 4 if you rotate the cylinder right and maybe squeeze a few darts slightly. From the user’s point of view, the cylinder rotates clockwise on prime. The loaded dart pictured above is rotated into top (firing) position on prime. 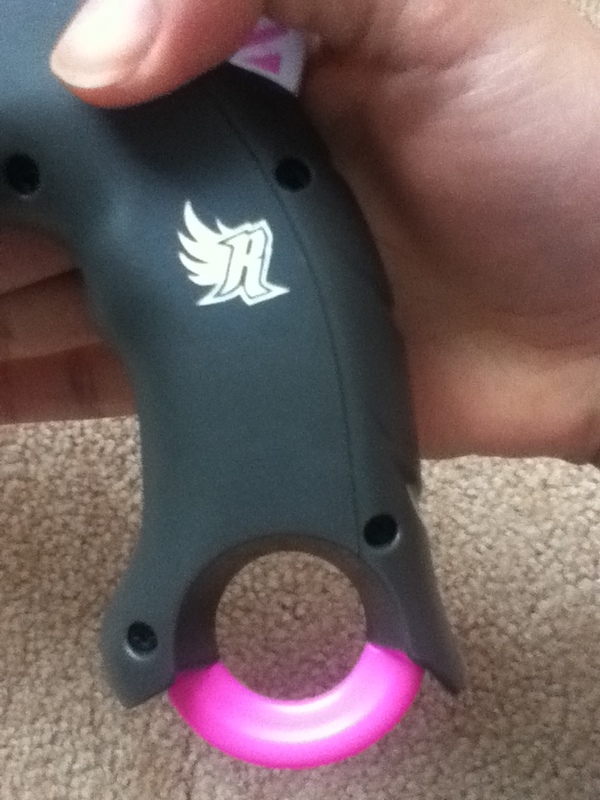 Close up of the SR trigger area. 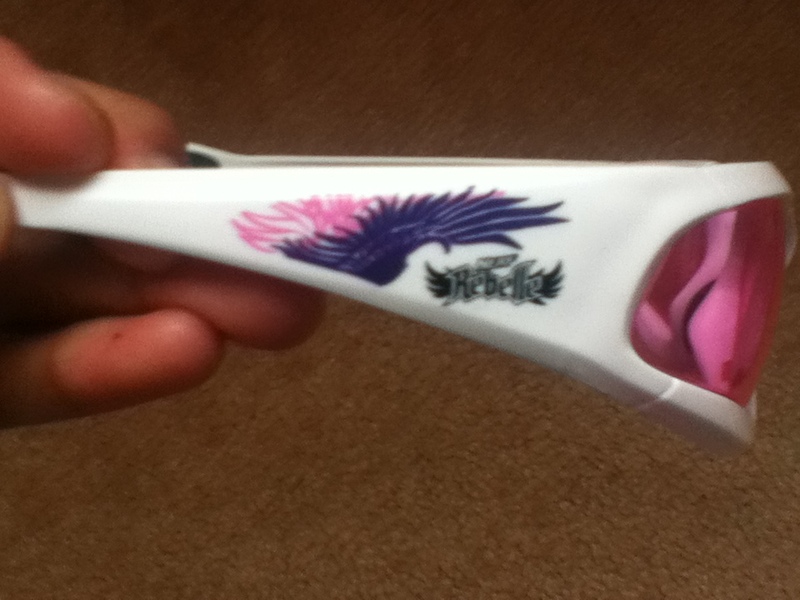 Close up of the Rebelle motif on the handle. Closer look of my natural hand position. The SR trigger area is a little unusual, the trigger gap extends diagonally downwards from the trigger, rather than straight forward. This is perhaps due to the trigger rotating on a pivot, rather than straight depressing inwards. 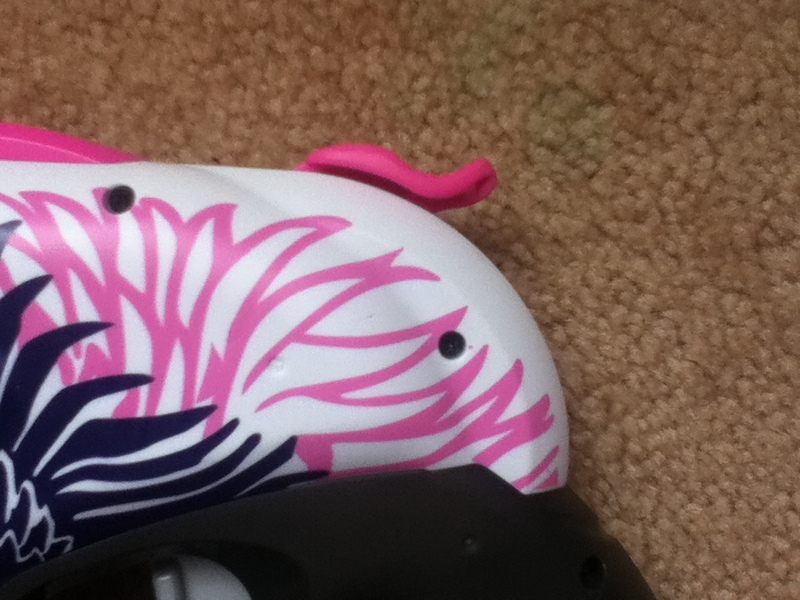 As a result, the trigger guard bulges out downwards slightly which is a little odd. The handle hooks towards the front. 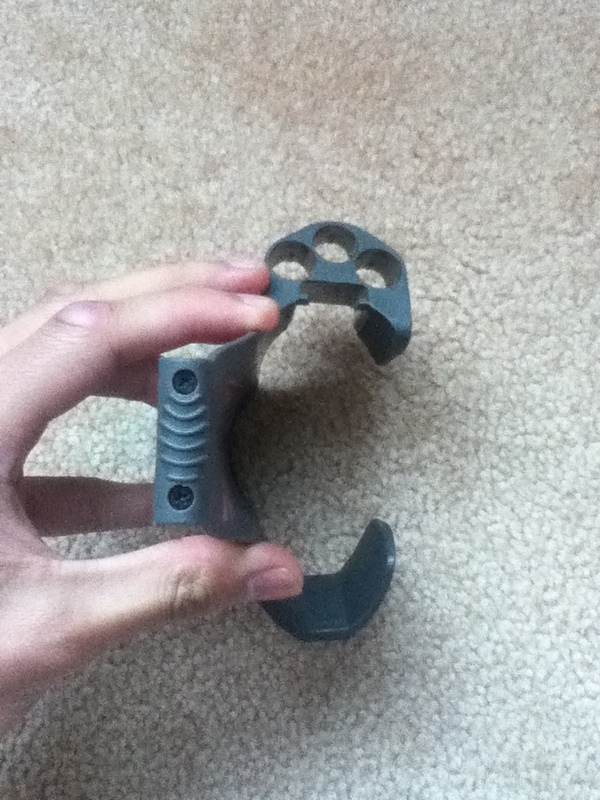 Combine this with the bulging trigger guard and there is not a whole lot of space for your middle finger between the trigger guard and the handle. 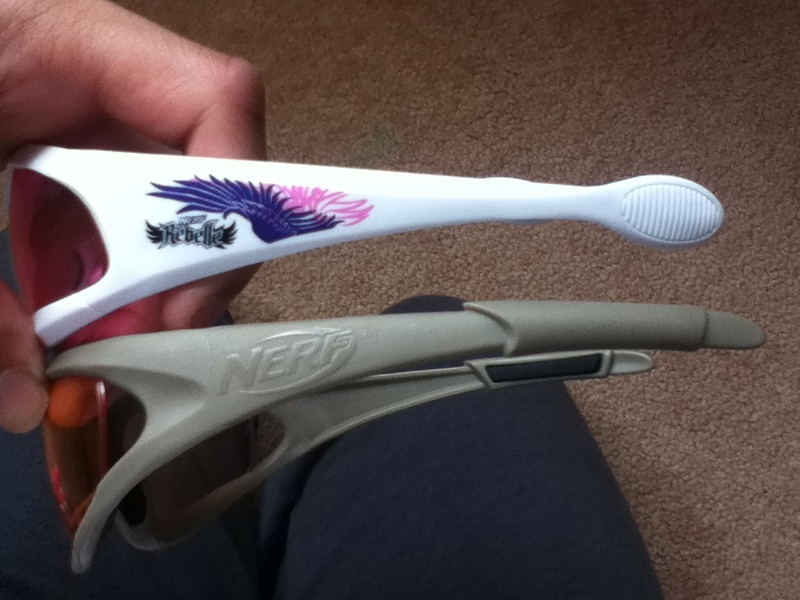 Besides that potential issue, I find the handle to be perfectly comfortable. My natural one-hander hand position rests quite high up, with my middle finger in particular being as high as possible, pressed into the gap. I find it comfortable, though that could be just due to significant use. Close up of the SR hammer. Close up of the SR hammer primed. Reaching for the hammer one-handed. The Sweet Revenge is of course hammer primed. The hammer rests far enough away to get a reasonable draw on it, while being not so far up as to be unreachable. It is just large enough to be easily grippable, while still being low profile. With my hand position pictured above, I can grip the hammer with my thumb fairly well, though I had difficulties priming with significant spring upgrades. I think a larger hammer like some aftermarket designs would help a fair bit with spring upgrades. The hammer catches as low as possible while allowing a good one-hander grip. 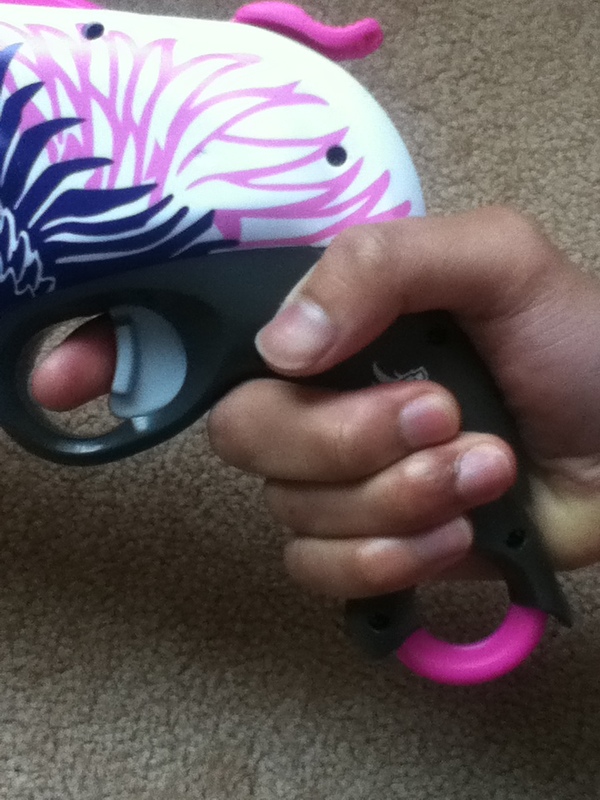 With my one-hander grip, the primed hammer just touches the gap between my thumb and trigger finger. Priming two-handed is no issue at all even with spring upgrades, and I find priming two-handed to be much faster than one-handed priming. 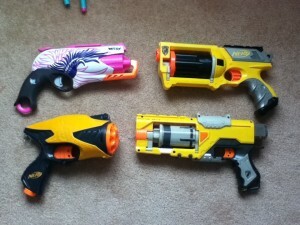 Sweet Revenge next to some other blasters. Here’s the Sweet Revenge next to some other blasters I had at the time, unfortunately no Strongarm or Hammershot (I actually don’t own either). It’s a reasonable length, I’ve never found length to be a real issue with pistol blasters, and is also noticably smaller and more space efficient than the other blasters pictured. 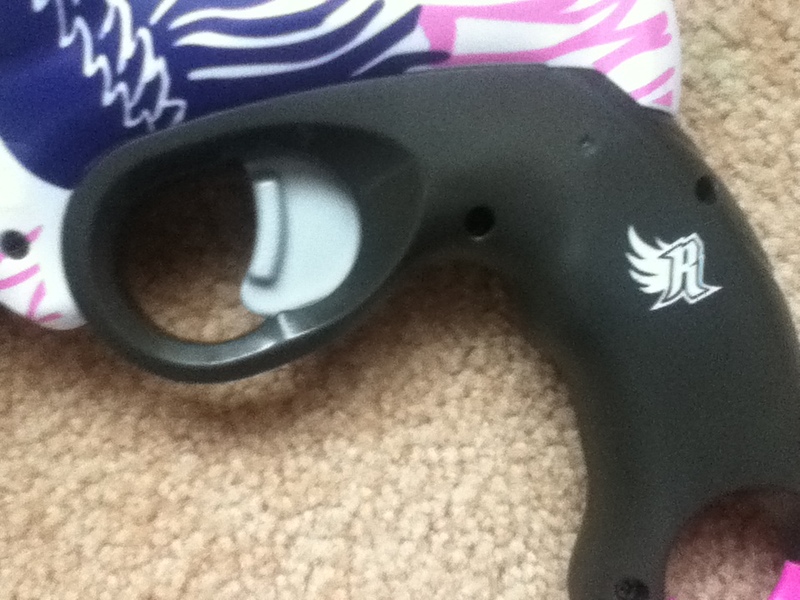 This allows pretty smooth and easy holstering of the SR. 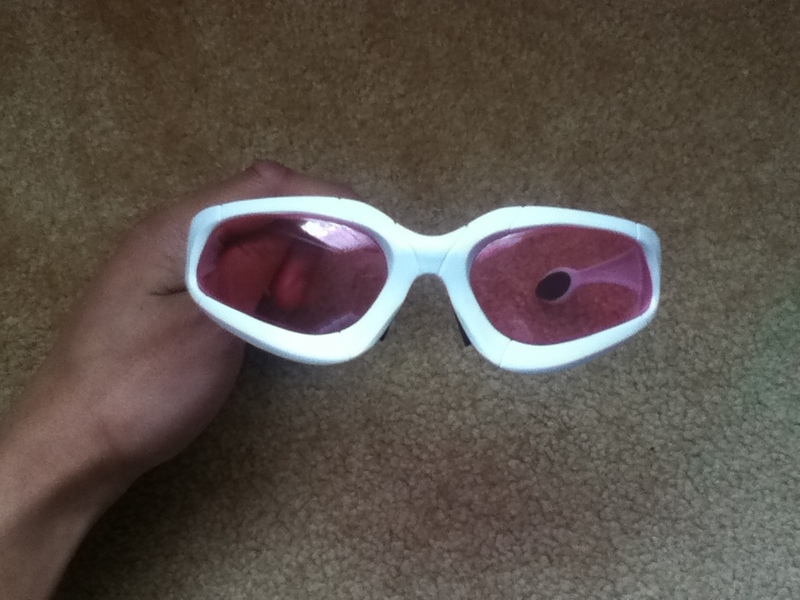 The Vision Gear is a very simple piece, just a plastic frame with two tinted lenses. 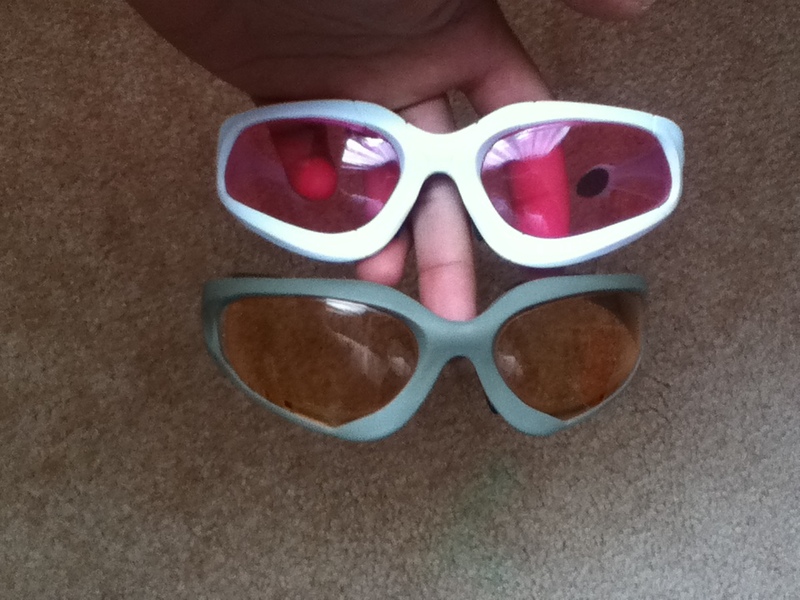 The lenses are supposedly able to block UV, but I see no reason why you would wear these as sunglasses. For protective purposes however, the Vision Gear are pretty effective as they’re quite tough. 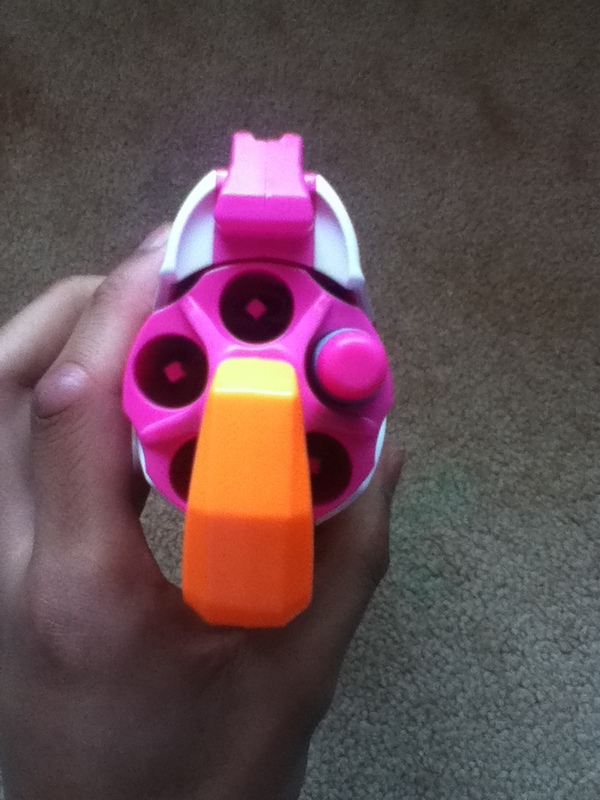 They can take darts from most of my modded blasters at point blank with no damage whatsoever. 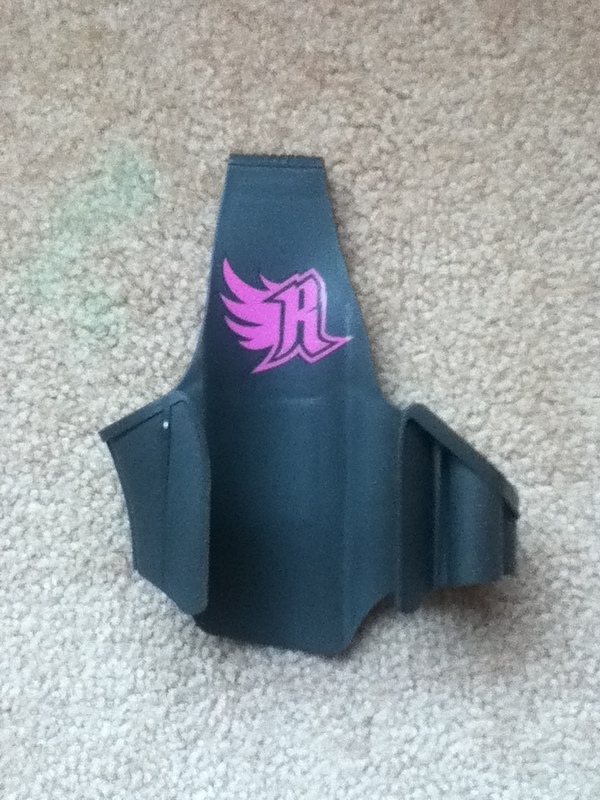 Front of the SR holster. Top of the SR holster. 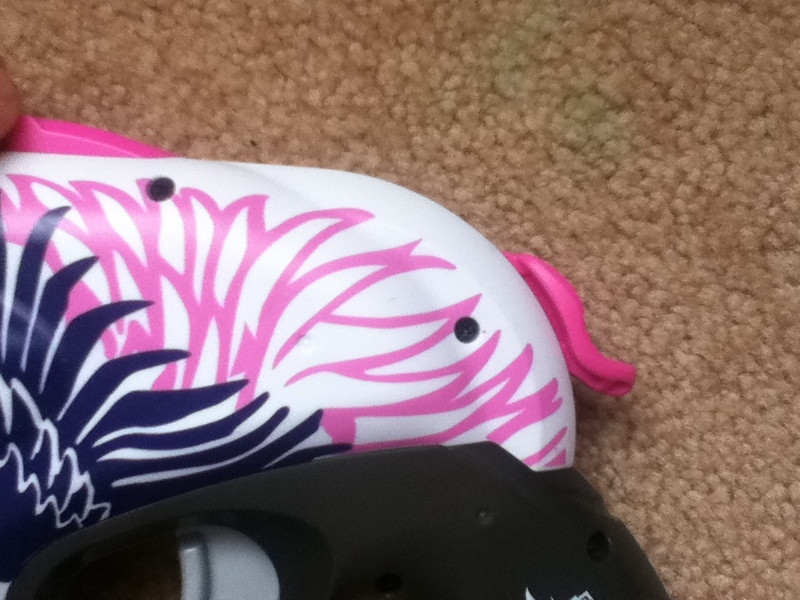 Side of the SR holster, looking at the belt clip. 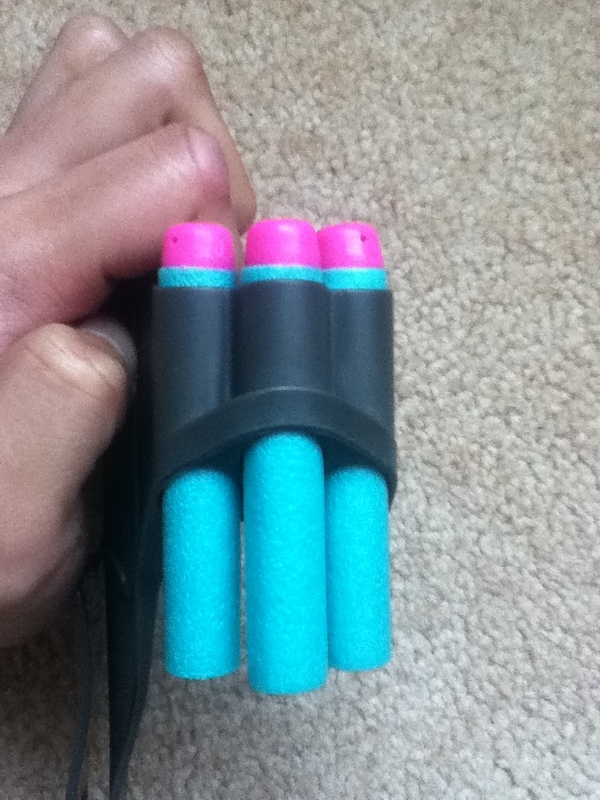 Darts loaded into the holster. Righ side of a holstered SR.
Left side of a holstered SR.
A far more interesting piece is the holster included. 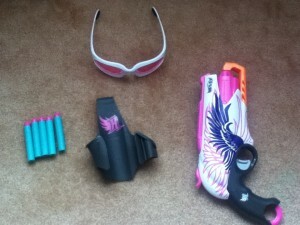 This was a first for Nerf I believe, no previous blaster had included a holster. 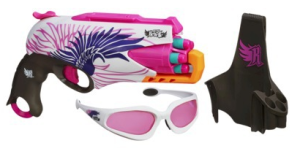 Even up to today only 3 blasters have included holsters, besides the SR, the Sidestrike and 4Victory also have holsters. 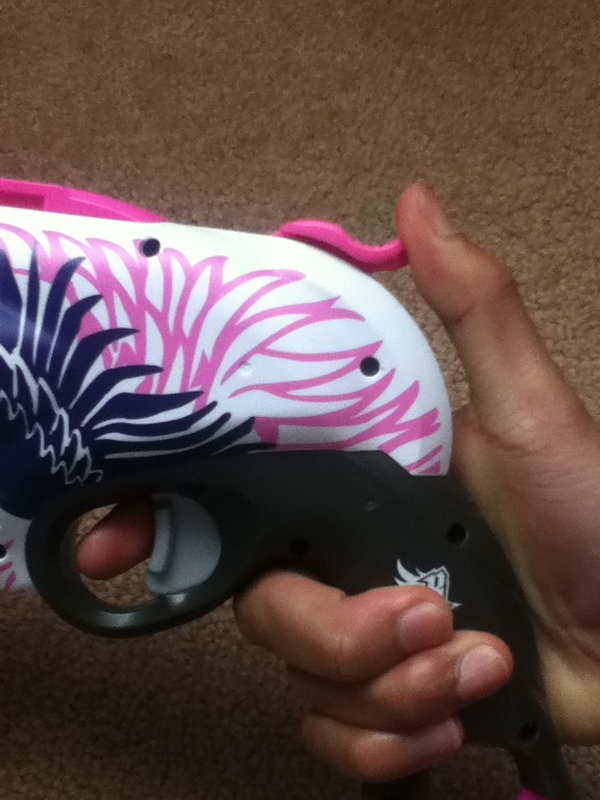 The holster itself is a single piece of plastic designed specifically to fit the Sweet Revenge for right handers. 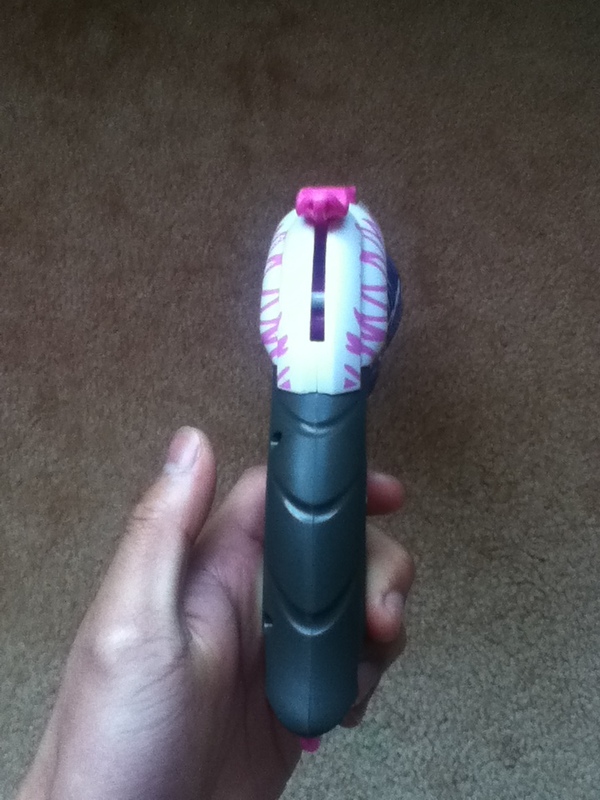 It doesn’t securely hold any other blaster. 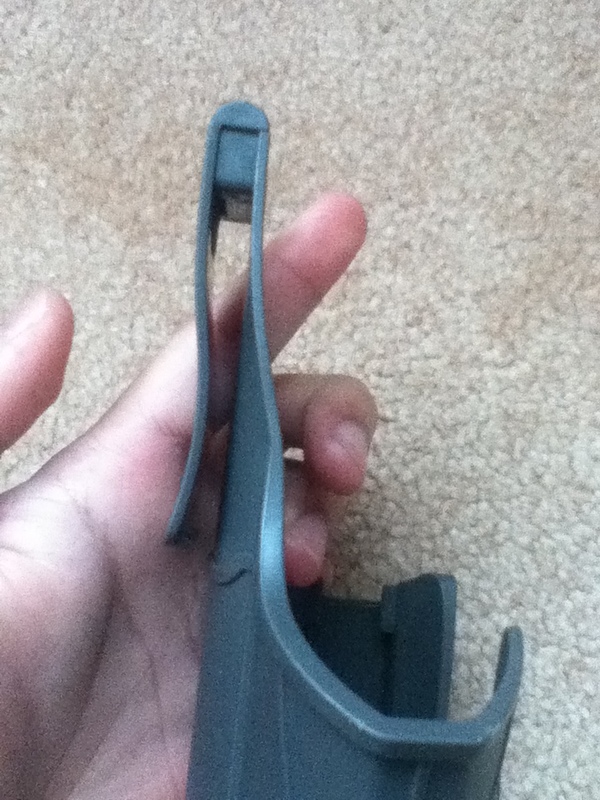 The holster has the curves to fit the SR perfectly, and also holds 3 darts on the front. The holster has a belt clip that attaches to a belt, pants, etc. It’s not the tightest or most secure fit, but for casual use works fine. In my experience at Melbourne HvZ, these holsters tend to pop off my belt, so I use a set of aftermarket holsters. SR holstered for left hand, left side. SR holstered for left hand, right side. The SR can be sort-of holstered for left hand, but not very securely. This is a little unfortunate if you’re intent on dual wielding or you’re left-handed. I was able to reconstruct a holster for left handed use here, and it worked surprisingly well, long enough for me to go and purchase a pair of aftermarket holsters. FPS shot of the SR. Range wise the Sweet Revenge gets about 11-13m ranges parallel to ground, slightly above average for grey trigger blasters. Certainly more than enough to be effective and usable. Accuracy is somewhat lacking, but like with all Elite-era blasters this is more due to Elite-style darts being horribly unstable. 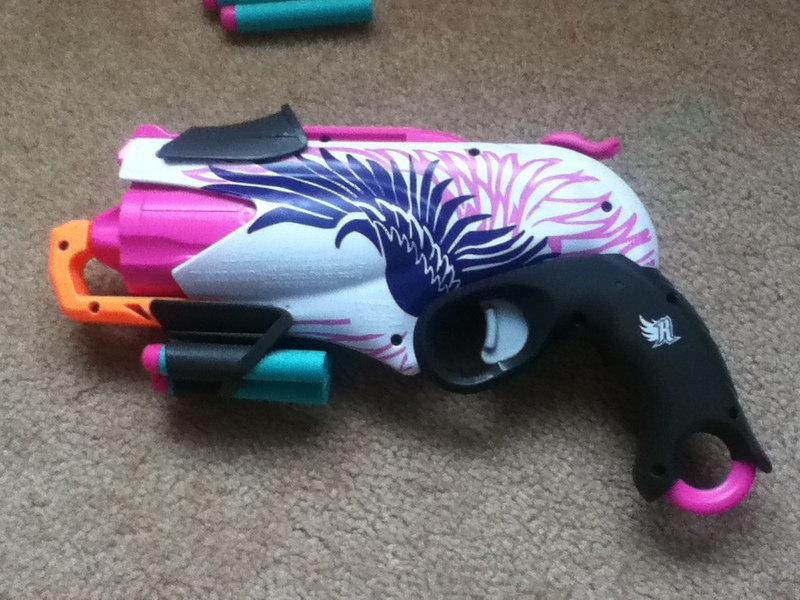 It’s good enough to still be effective in close quarters, and with proper darts it’s no issue. Rate of fire depends on whether you one- or two- hand it. One handed I can fire off around a dart per second, which is enough when dual wielding and running. Two handed I can get around 2 darts per second. 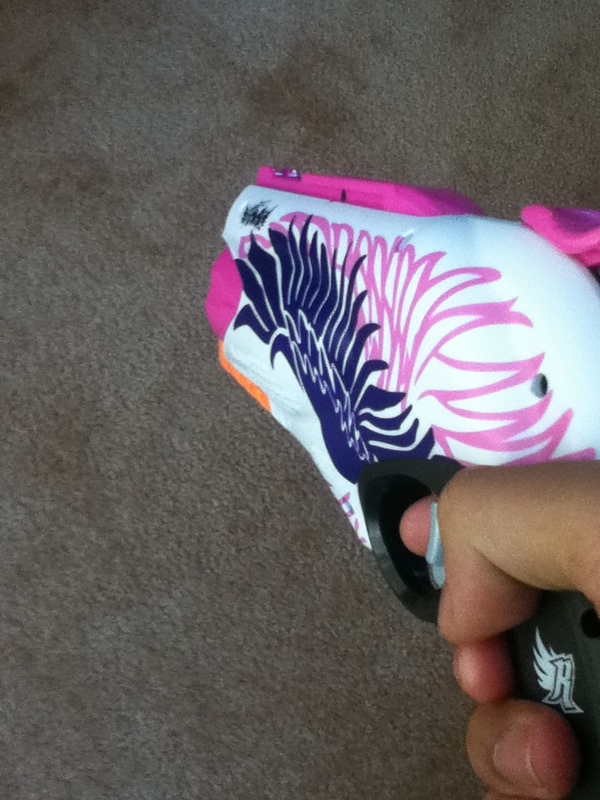 The Sweet Revenge and its Zombie Strike brethren, the Hammershot, serve as the premier one-handable sidearm. They are easy to use, sufficiently powerful and hold just enough darts. 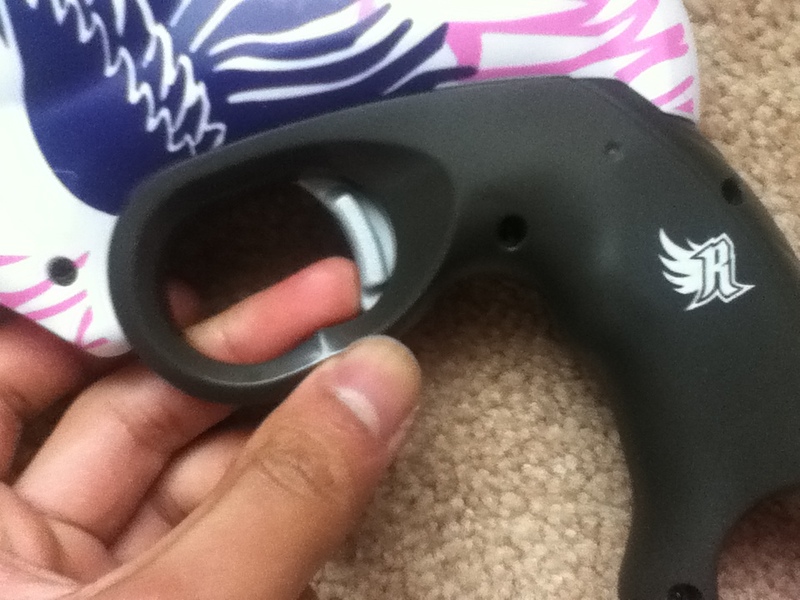 One-handability allows you to pick up darts, reload, carry a flag, etc while still protecting yourself. 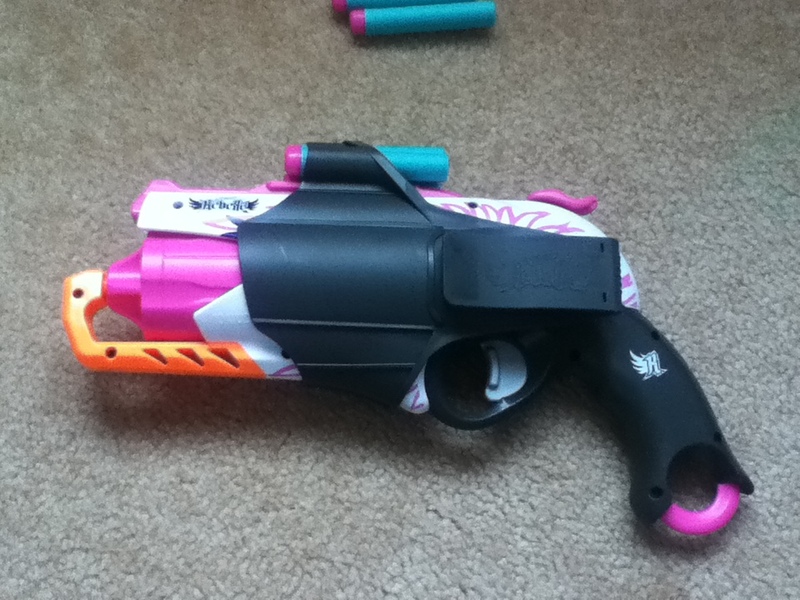 Some people prefer two-handable sidearms like the Strongarm, and others a compact clip (mag) system sidearm like a Stryfe. 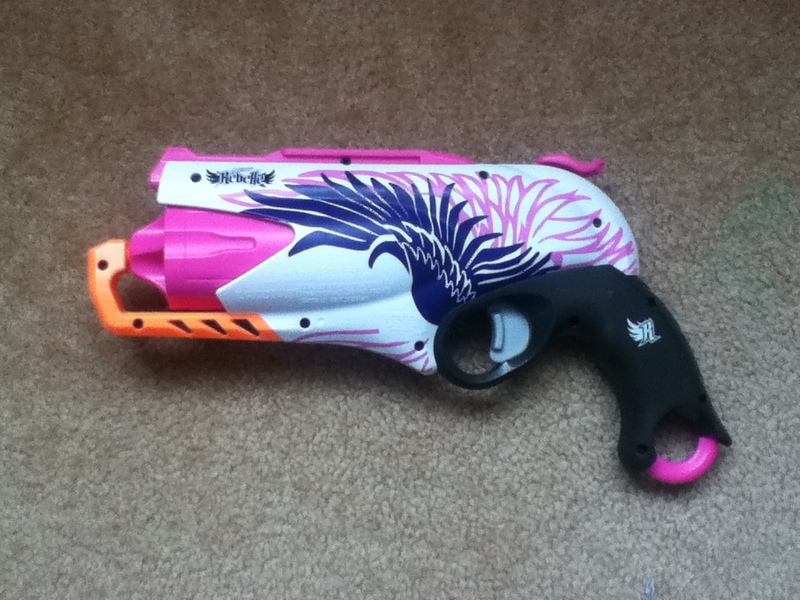 But for a significant fraction of Nerfers the Hammershot/Sweet Revenge is the go-to sidearm. I personally dual wield Sweet Revenges as my sidearms. 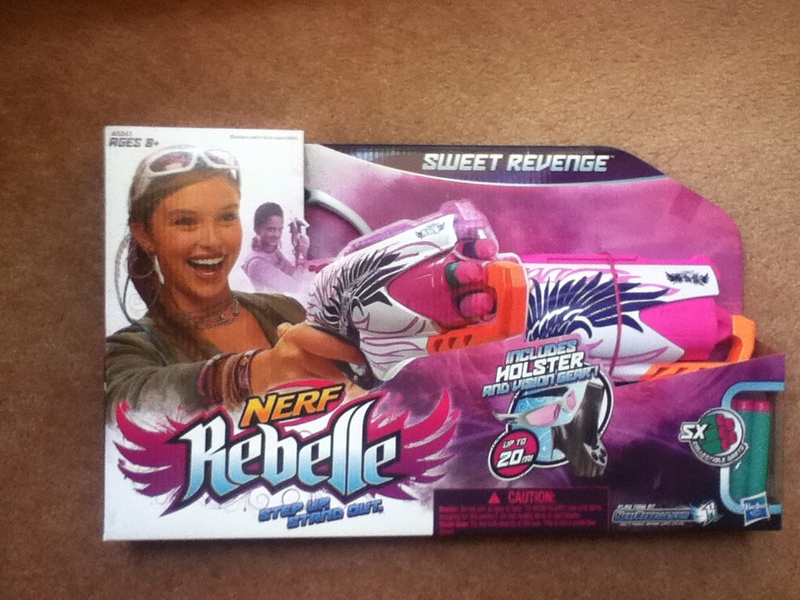 The Sweet Revenge was available from BigW for 25AUD, the same price at which most stores stocked Hammershots. While not quite as bang-for-buck as the Strongarm (which can be found at 12AUD and less), the full Sweet Revenge kit provides pretty solid value. Sure the holster is pretty cheap and the vision gear is pretty worthless, but it’s still something. A few more dollars can afford you a Retaliator which I’d say is a bit better value, but the Sweet Revenge Kit still represents pretty solid value. Maybe I’m just biased towards the Sweet Revenge. 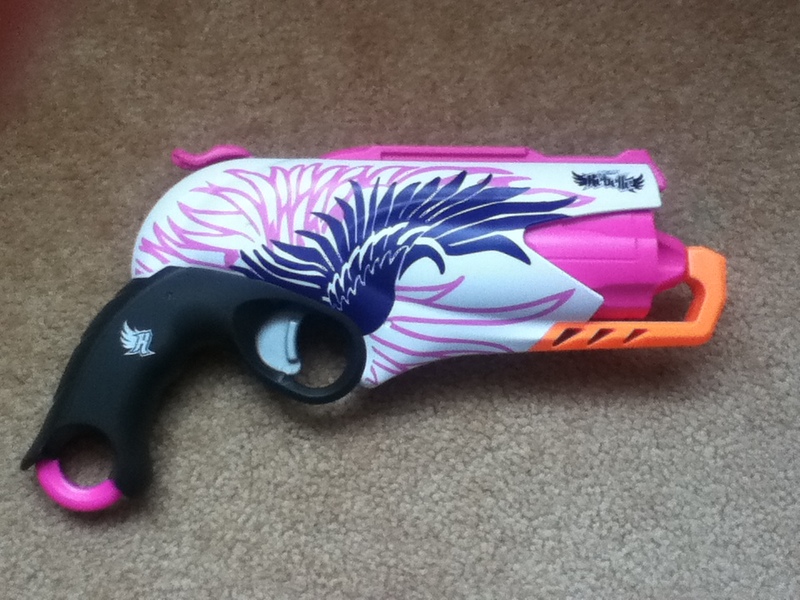 The Sweet Revenge is an all round pretty good sidearm blaster, and has served me very well in many games. The stock Sweet Revenge/Hammershot spring is pretty strong compared to most stock springs, since they have to deliver Elite level power with a very short prime stroke. The short stroke also severely limits how much power you can get out of the SR. A further issue is that it is hammer primed – so spring strength is further limited by how strong your thumb is. Nevertheless it is possible to get some reasonable power out of the Sweet Revenge/Hammershot platform, certainly enough for sidearm duty. 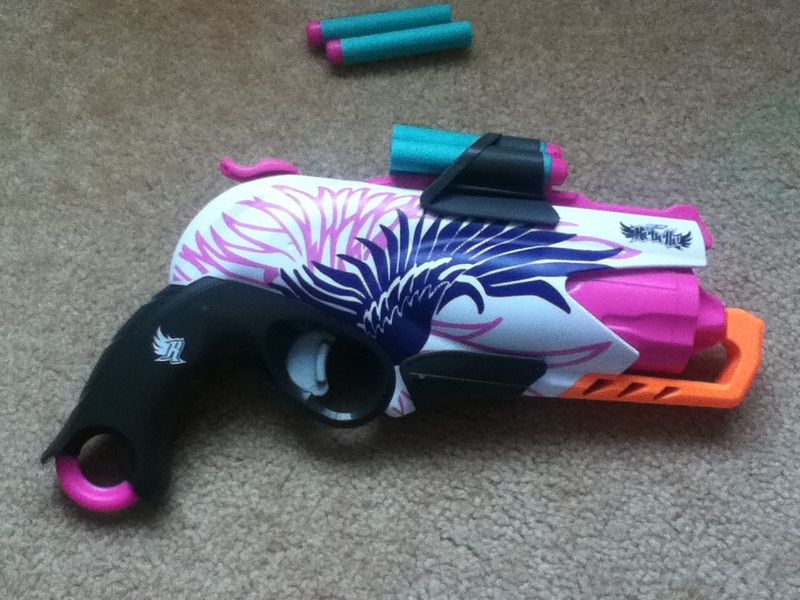 Being so popular, the Hammershot has also received a number of aftermarket parts, such as hammers, some of which are differently shaped if you find the stock hammer to be unsuitable. Additionally, recently some people have designed (and have started selling) aftermarket cylinders, designed to hold extra darts. One particular 3D printed cylinder has been designed to hold 7 darts, a whole 2 more darts than the stock cylinder and even 1 more than a Strongarm, which is pretty significant. 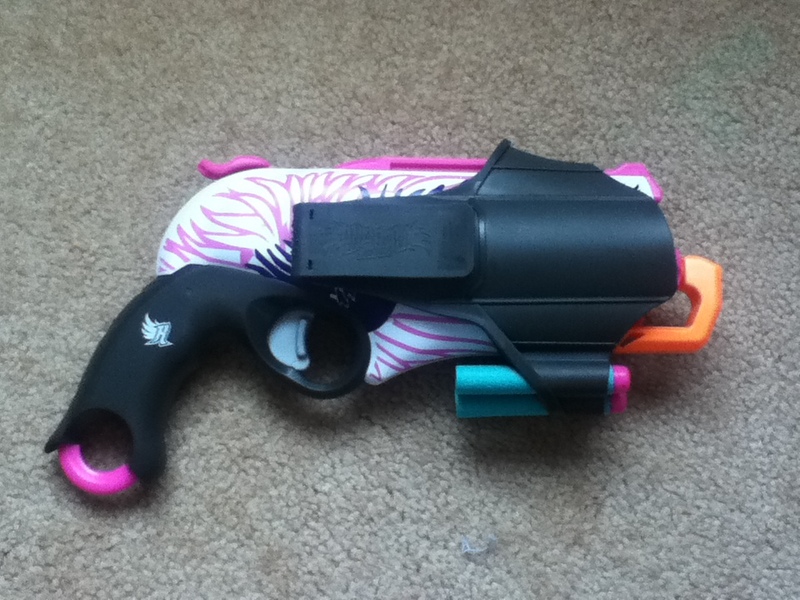 Even without modification the Sweet Revenge is a very solid sidearm, I see a number of both SRs and Hammershots at Melbourne HvZ with various levels of modification. I dual wield a pair of lightly modded Sweet Revenges myself, they’re powerful enough to nail zombies at reasonable ranges, but weak enough to be primed with ease with either hand. 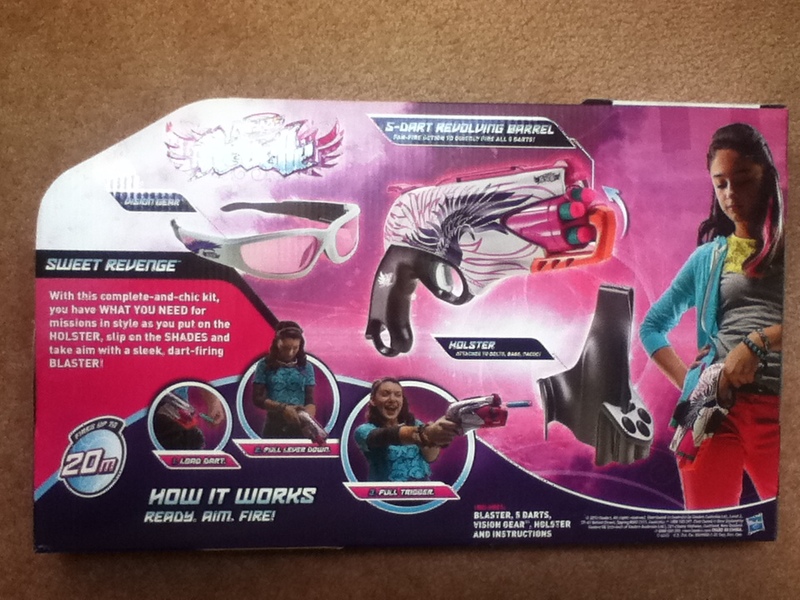 This entry was posted in Dart Blasters, Reviews and tagged 20m, australia, grey, nerf, rebelle, revenge, review, sweet, trigger on December 3, 2015 by Outback Nerf. Review: Nerf Doomlands Lawbringer Blaster Hub Supports Post/Page/Forum Embedding!